To have more fun on the river, and to progress from easy to intermediate whitewater paddling, we have to learn to "play" the river. Our full day River Play course focuses on honing your fundamental skills while introducing you to advanced skills including wave running, eddy hopping, S-turns, jet ferries, and surfing standing waves! 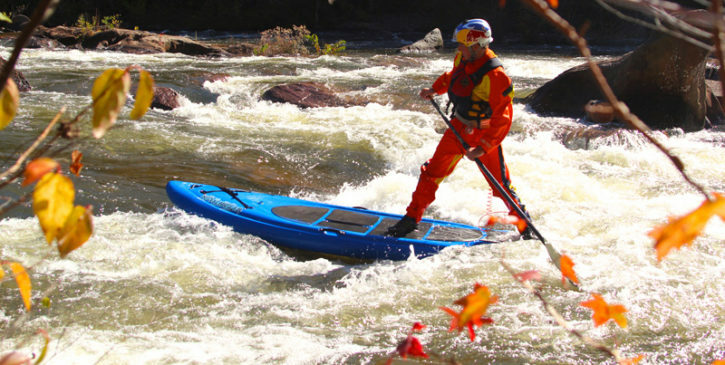 Upon completion of this course, you will have the skills and confidence to paddle your SUP on Class 1-2 rivers! You will receive the Paddle Canada SUP River 2 skills certificate. 1:4 (MAX) Our ratio is the lowest in Alberta to ensure you have the best instructional experience possible! ?Part of the famous Undercurrents experience! After you complete this course get out and paddle! Practicing is the proven way to hardwire your new skills, so that you can enjoy a lifetime of safe paddling. Then, become a SUP River instructor! Undercurrents has teamed-up with Paddle Canada Instructor-Trainer Neil Gilson of Bearfoot Performance Paddling to bring you this course. Successful completion of River SUP Next Step course, or equivalent. A River SUP Next Step course occurs on the day and a half immediately before this course - you can combine the two course for a weekend packed full of river fun and education! River SUP Play takes place on the Kananaskis River (Google map).